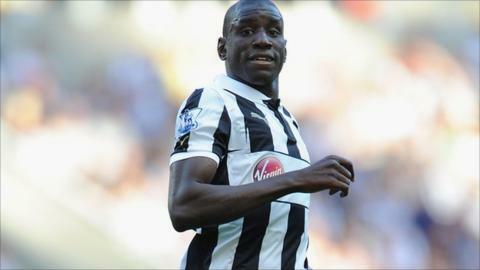 Newcastle manager Alan Pardew says he is still hoping striker Demba Ba will remain at the club after January. The Senegal striker's representatives held talks with Chelsea on Sunday, later described as unproductive. Ba, 27, has a £7m-release clause in his Magpies contract which is due to become active again on 1 January. "I still think it's even whether he will stay or go. I'd like to think he will stay in this window. That will be his decision," Pardew told BBC Sport. Newcastle have spent recent months attempting to negotiate a new contract with Ba which would remove the clause, and that deal remains on the table. However, Pardew insisted the club would not do so indefinitely. "The situation with that is that it's getting close to the point where we say 'no more', but the offer is still there. "The contract is what it is, we are all aware of that, and for me as the manager I need it resolved as quickly as possible. That's the best situation for our fans and for the club." Pardew has also hit out at the network of people representing Ba, who has 13 goals in 21 appearances this season. "In some respects I feel a little bit sorry for Demba," added Pardew. "There are people out there fuelling this who are not actually involved or want to be involved and that's the sort of world that we are in." Ba was also involved in a dispute with Hoffenheim as he looked to secure a move to the Premier League during the 2011 January transfer window. The German club eventually agreed to let their striker move to Stoke in a reported £6m deal, but Ba failed a medical, according to the Potters, before eventually securing a move to West Ham later that month. The forward scored seven goals in 13 games, but invoked a release clause in his contract after the Hammers were relegated. The Magpies needed a player to fill the void left by Andy Carroll, who had earlier joined Liverpool for £35m, and signed Ba on a three-year deal in June 2011. The Senagalese player scored 16 goals during his first full season as Newcastle finished fifth and qualified for the Europa League. He is the club's top scorer this season and his departure would leave just Papiss Cisse and Shola Ameobi as the only senior strikers at the club. The pair have scored eight goals between them during the current campaign.